Despite complaints of poor cinema schedules for Three Wise Men, producer of the flick, Opa Williams, said the movie rocked. “Three Wise Men as a movie comes with all the ambit of modern film practice; high production value, star power, strong entertainment and thematic thrust,” noted the ace producer on Thursday. A movie maker who saw the movie but wants to remain anonymous however flayed the distributors, observing that they should have supported the movie which is also a BOI project because the distributors also got BOI support. “The distributors have not fared well to support the BOI initiative of elevating the industry,” he said. Directed by Pat Oghre-Imobhio and produced by Opa Williams, ‘Three Wise Men’ is one of the beneficiaries of the Bank of Industry (BoI)’s loan scheme tagged Nollyfund. Apart from being a BOI sponsored movie, the film is the project of one of the pioneers of Nollywood producers, Opa Williams, with Okey Ogunjiofor’s yet-to-be-released flick ‘Queen Amina’. 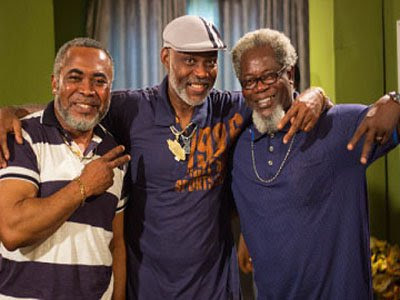 ‘Three Wise Men’ tells the story of three retirees acted by Richard Mofe-Damijo, Zack Orji and Victor Olaotan, who settle in a suburb to enjoy their retirement benefits after many years of service in different government parastatals. Leader of the gang, Irikefe (RMD), a divorcee with three failed marriages after five children, refurbishes his flat, buys a laptop, a nice sports car and goes shopping for jeans, T-shirts, sneakers and everything a young man could dream of. The three men become an item as Irikefe introduces them to his world of fun; from tracking girls on Facebook, Twitter, Instagram, joy riding to clubbing. RMD’s portrayal of this ‘sagging’ and tattoo-wearing characters makes as much thrilling effect as his act of taking selfies and posting them on his social media platforms. Other cast of the movie include Ebere Okaro, Thelma Nwosu, Uche Nwaefuna, Akunna Nworgu and Stanley Edirin Isokoh.